Aunt Rena is in a place where she often cycles around to the same story over and over when you talk to her. We had a good conversation today and the only cycling was when she told me over and over and over about the brownies she was making. Her brownies are Duncan Heinz but she cooks them to absolute gooey perfection and now I'm so hungry I could scream. She took my late call in stride. I was still the first person of my generation to call and she'd gotten my card already. I'm trying to think of it as just extending the celebration but it's not stopping me from kicking myself a little. The other thing about talking to her is that if you just hang around and listen some she'll usually throw in one story about the olden days that you've never heard before. Today, after the third time we almost said goodbye she told me she was a premature baby. Her mother was being forced to move (her father had just died, her sister wasn't quite a year old) and wanted to get moved before the baby came. She finished the move at midnight and Rena was born at 1am. This is the stock I come from, people. Which is why it's super embarrassing that I may have broken my toe (4th one on the left). I was not 9 months pregnant and moving house by myself. I was not in a tragic factory accident. I was not pulling a child from a burning building. I was going to bed. 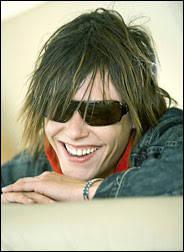 Wasn't even leaping into bed with Kate Moennig (pictured) and forgetting myself in a moment of passion. Sigh. Stubbed my toe on the dog's ramp plain and simple. Owie, owie, owie! I'm sorry about the piggy. Happy birthday, Rena! I was born 6 weeks premature the day after my parents moved - so moving when pregnant apparently not a good idea. But my parents were thankfully not going through what Aunt Rena's were, though my brother was also not quite a year old - I was born 4 days before his 1st birthday. I hope if I reach 93 I'm still able to bake (and eat) brownies! She put almond oil in the batch because she likes almonds but she was only putting decorative almonds on half because she can't chew the nuts. Heinz makes ketchup. Duncan HINES makes the brownie mix. I love that my misspelling of product names brought someone out of lurkdom and made them comment!